A great price for such a fabulous screen, with just a few niggling flaws. The picture here doesn’t really do this screen any justice at all. This is Philips’ 40-inch 4K monitor. Yes, monitor. For all it’s televisual heritage the BDM4065UC, or wunder-screen as I’ve taken to calling it, is a proper PC monitor. 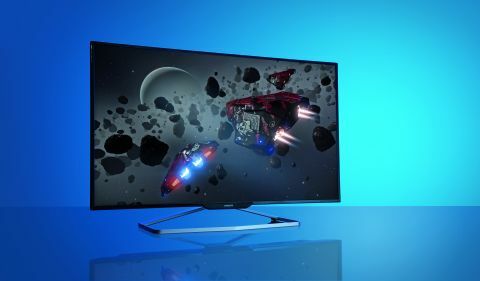 It’s got a full DisplayPort connection, as well as a host of HDMI ports, and a decent VA panel capable of throwing its 4K weight around at a full 60Hz. This is genuinely the first 4K monitor to make me give a wet slap about the current super-resolution de jour. Every other 4K monitor I’ve tested has simply been too small. And yes, I’m including the 32-inch, hyper-expensive Asus in that statement. I guess I’m a scaling snob. While Windows 8.1 has improved things in that regard, it is still most definitely not the optimum experience running your OS at anything other than plain ol’ 100% scaling. And running a 4K panel at 100%, even the relatively large 28-inch screens, means you’ll still be forever squinting at text and icons. After using one as my main screen for a good while I found I was getting back ache from constantly hunching over to press my nose against the screen. But with this enormous 40-inch panel you’ve got almost the same pixel pitch as a 27-inch 1440p monitor. That makes things perfectly easy to read; and with the bright, clear VA panel Philips have used in the wunder-screen, the colours and contrast are far better than the improved TN panels we’ve seen recently. And because it’s a VA panel you get the inkiest blacks of any screen technology, and boy, does Elite: Dangerous look good writ this large. There’s also the fact that blown up to 40-inches you get the full impact of the increased detail levels 4K gaming is able to offer. I’ve played Shadow of Mordor at 4K before, but with the Philips was the first time the detailed textures really had such an impact. On the 28-inch, or even 32-inch 4K screens, you really don’t get such a feeling for the extra resolution. Aside from the performance drag, there seems to be very little difference between gaming at 4K or at 1440p. Blown up to 40-inches, the difference become much clearer. On 28-inch, or even 32-inch 4K screens, you really don’t get such a feeling for the extra resolution. It’s not a big surprise that a huge, high-res screen would look good. That should be almost a given. What is maybe a bit of a surprise is just how quickly you get used to using this vast expanse of screen on a desktop. You’ll probably be looking at your current screen not thinking you could seriously cope with a 40-inch panel sat on your desk a few feet from your eyeballs, but I guarantee it wouldn’t take long for you to become totally used to, almost dependent, on that vast desktop real-estate. That doesn’t diminish its impact, just stops you feeling so dwarfed by it. The other surprise is just how good a value it is. Yes, $850 (£600) is a lot of money, but this is a screen that’s still likely to look damned good in five years time. Probably longer. You’re likely to go through a good few graphics cards before you need to replace your screen. I still regularly use an almost decade-old Dell 3007WFP on our test bench. It was a vast amount of money at the outset, and its 30-inch 2560x1600 screen was far in advance of what the average gaming PC was capable of at the time. But over the last ten years it’s proved itself time and time again, justifying its price through constant use. Sat beside the Philips BDM4065UC, it’s starting to look very small and very old. But this Philips screen is not the perfect monitor. There are most definitely compromises made to hit this large scale and this still very competitive price. The VA panel is good, much better than the 4K TN panels, but it gets visibly darker in the extreme corners. Though that’s likely to be more a viewing angle issue from sitting close to the screen than a problem with the actual backlighting. And because the basic design is almost entirely ripped from Philips’ 40-inch 4K TV the stand is also a bit rubbish for a PC screen—there’s no movement allowed whatsoever. Despite the comparatively low response time (8.5ms GtG) I didn't see any problems with either inverse ghosting from the overdrive settings or any input lag either. These are sometimes the problems gamers can find with shifting from a TN panel with a low response to an IPS or VA screen with a higher one, but personally I couldn't see any instance of it holding back this display in a gaming setting. In terms of colour, the Philips panel is rocking a true 8-bit screen, but looks to be using some sort of frame rate control (FRC) to mimic the effects of a 10-bit panel. Philips are quoting a full 1.07 billion colours with the BDM4065UC as opposed to the 16.7 million you'd expect from a standard 8-bit monitor. That puts it well ahead of the Seiko we saw at CES in that context. The Philips BDM4065UC is though a bit tricky to get hold of at the moment, though we are assured the US release is on track for Q1 this year. In the UK Amazon is also still quoting up to a two month wait on shipping as well. Considering how long it’s taken for the 34-inch super-wide AOC U3477Pqu (from the same parent company) to get into stock that’s probably not much of a surprise. These supply problems and minimal image issues aren’t deal-breakers though, but it does introduce the feeling that there might be an utterly brilliant 40-inch 4K monitor on its way that uses the same panel to better effect. So long as you’re aware of those slight issues though you’ll be more than happy with your massive-o-monitor and the quite wonderful things it does to your games.